Moina Belle Michael, a schoolteacher from Georgia, successfully established the Flanders Field Memorial Poppy as a universal symbol of tribute and support for veterans and their families during World War I and II. Known as the Poppy Lady, Michael dedicated her life to servicemen and women, buying and placing fresh flowers in rooms where they would gather before heading overseas. Author Barbara Elizabeth Walsh and artist Layne Johnson worked with experts and primary documents, as well as Moina's great-nieces to better understand Moina's determination to honor the war veterans. A portion of the book’s proceeds will support the National Military Family Association’s Operation Purple®, which benefits children of the U.S. military. Barbara Elizabeth Walsh has fond memories of poppies and parades honoring her father and other veterans. During World War II her father knew Moina Michael, the Poppy Lady. A former elementary-school teacher, Barbara has written articles for Highlights for Children and Cricket. The Poppy Lady is her first children's book. She and her husband live in Mantoloking, New Jersey, and Key Largo, Florida. For more information, visit barbaraelizabethwalsh.com. Layne Johnson has illustrated more than twenty books for children, including the Western Heritage Award--winning Off Like the Wind! : The First Ride of the Pony Express by Michael P. Spradlin. Mr. Johnson speaks frequently in schools and libraries. He lives in Houston, Texas, with his wife. With the centennial of the World War I armistice approaching on November 11th, 2018, I decided I wanted to feature books about 'The Great War' or World War II each Monday of this month for my Marvelous Middle-Grade Monday posts. A couple of months ago I began searching the local library's online catalog for appropriate titles, and I was thrilled to find this gem in the collection! Moina Belle Michael was raised in the small community of Good Hope, Georgia, after the Civil War. Families had lost everything in 'The Surrender' and could not afford to hire a teacher for the local children. Moina's mother was determined to help her daughter become educated so Moina could teach her younger siblings and the neighbor's children. After three years of boarding school fifteen-year old Moina cleaned out an abandoned slaves' cabin on the plantation and opened a school for her siblings and a few local children. In the summer of 1914, Miss Michael had been traveling in Europe when World War I broke out. When the Germans sank an American ship in March, 1917, she prayed the United States would not enter the war. At this time, she was a teacher and dorm mother at the University of Georgia's Normal School. She dreaded the U.S. Congress's vote on whether the nation would enter the war. When it was announced that the United States was joining in the war in Europe, Moina vowed to do whatever she could to help the soldiers. She wanted them to be remembered for their service and sacrifice. She knitted sock and rolled bandages with other local women. She delivered treats to the nearby military camp and invited soldiers to share a meal at her home. She wanted to help out somehow. She reflected upon what she could do to help the war effort. She decided it would be worthwhile to help the soldiers before they left for their assignments overseas, so she opened a reading/meeting room in the basement of a hall on Columbia's campus. Men and women in the military along with university secretaries visited the room each day to read, sing, and visit with others. Miss Michael used her own meager salary to buy flowers to brighten up the dreary basement. She felt called to do more to ease the stress of these soldiers who were serving or had served their country in war. By chance, Moina read a poem in a magazine written by Lieutenant Colonel John McCrae who was a Canadian physician. The poem, 'In Flanders Fields', was a tribute to the soldiers who perished on the battlefields of Flanders. In the poem, the battlefield was covered with white crosses and bright red poppies. Then and there Moina Belle Michael vowed to buy red poppies to give out to others and to always wear a red poppy herself in honor of the poppies of Flanders Fields. She went out shopping in New York City to purchase red poppies. She found one large and twenty-four small silk poppies in a single department store. She pinned one poppy to her collar and hurried back to the basement room. She placed the large poppy in a vase and handed out the twenty-three smaller ones to the men and women leaving for France. It is striking that two days after she purchased the twenty-five poppies, World War I ended. She was not ready to rest. She saw how difficult it was for the returning troops to find jobs and get the medical care they needed. She decided to help out by trying to get various organizations to honor and support the veterans by adopting the Flanders Fields Memorial Poppy. People around the world began to donate money to the funds to help veterans, war widows, and orphans. Many unemployed and disabled veterans made and distributed poppies. 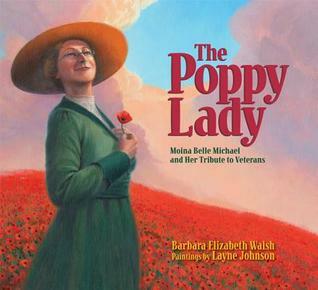 Moina was named the 'Poppy Lady'. Moina Belle Michael died at the age of seventy-four and was honored with a military funeral in her honor in Athens, Georgia. The 'Author's Note' tells the touching story of how her own father had met Miss Michael when he was a soldier in World War II. The soldier, Pat, told his author daughter about how nice Miss Michael was. This prompted Barbara Elizabeth Walsh to research and write this compelling biography. The 'Legacy' section tells how the Flanders Poppy is still recognized as a symbol of remembrance. These poppies are still distributed by several veterans groups in America. A 'Selected Biography' is included. The original paintings by artist Layne Johnson are beautiful and contribute greatly to this amazing woman's biography. This biography is highly recommended to parents/grandparents, librarians, teachers, and fans of American history/World War I history/military history/twentieth century history. It is inspiring and engaging and will show a true-life example of a woman who dedicated her life to serving others. 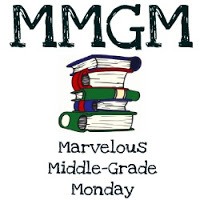 Find the links to read more great Marvelous Middle-Grade Monday posts from middle-grade authors and bloggers at Greg Pattridge's 'Always in the Middle' Blog. I hadn't heard about "the poppy lady" before. So interesting! Thanks for featuring this book. Great focus for this month. I enjoyed your review on a topic I don't know much about. The poppy lady and her passion were heartfelt. I hadn't heard of her either. Sounds like a book I would have really liked as a kid. This book is fantastic for Armistice Day coming up. I love how the author was inspired by the Poppy Lady and wrote a book for her. Lovely review. Very interesting! I'll have to look for this book. I hadn't heard about it. Thanks for your review. This is a lovely book. I read it when it first came out. I should revisit it. Thanks for the post.